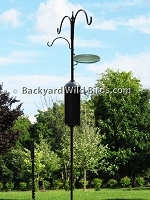 Bird Feeder Pole kit has a superb Squirrel Stopper Pro bird feeder pole with a black squirrel baffle below. This bird feeder pole baffle stops squirrels and raccoons from climbing up the pole. These squirrel proof bird feeders offer sunflowers, peanuts and thistle bird seed to wild birds. These types of bird seed attract a large number of different birds. It also comes with three 16" clear weather domes to keep the seed fresh and out of the weather. The pole includes a mounting auger for easy installation. 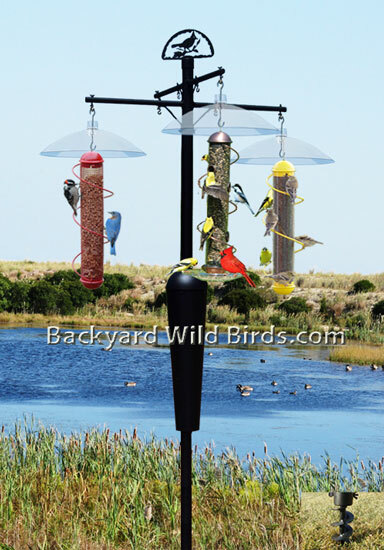 The tube bird feeders are made of polycarbonate and aluminum. The red peanut feeder mess is stainless steel and is for clinging birds like woodpeckers, nuthatch, chickadees, etc. The Spiral Thistle Feeder on right is for Goldfinches and their thistle (Nyjer) seed. The Copper birdfeeder with Cardinal tray can use sunflower seed to attract all kinds of songbirds at its multiple port openings. The seeds these three bird feeders handle includes thistle, black oil sunflower, peanut, and blends, etc. The spiral bird feeders have a manufacturer lifetime warranty on workmanship and normal wear and tear. Birds love to "Run the spiral" and what better way than with this triple play in your backyard!